The jazz musician was one day shy of his 92nd birthday. Jazz musician Dave Brubeck died Wednesday morning at Norwalk Hospital, in Norwalk, Conn., his longtime manager-producer-conductor Russell Gloyd tells the Chicago Tribune. Brubeck, who would have turned 92 on Thursday, died of heart failure, en route to "a regular treatment with his cardiologist," said Gloyd. A birthday party was planned in the town of Wilton, Conn., featuring his son, Darius Brubeck; Richie Cannata, sax player for Billy Joel; and Bernie Williams, former New York Yankees star. The pianist reached pop star status with recordings including Take Five and Blue Rondo a la Turk. 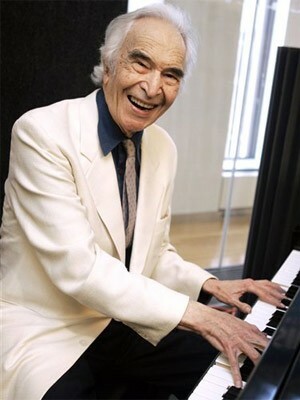 Brubeck, who once said he considers himself "a composer who plays the piano," wrote and recorded several large-scale compositions since the 1960s, including two ballets, a musical, an oratorio, four cantatas, a mass, works for jazz group and orchestra, and many pieces for solo piano. He has appeared at the Newport (1958, 1972, 1981), Monterey (1962, 1980), Concord (1982), and Kool jazz festivals, and performed at the White House (1964, 1981). "For as long as I've been playing jazz, people have been trying to pigeonhole me," he told the Tribune in an interview. "Frankly, labels bore me." Brubeck is survived by his wife, Iola; four sons Darius, Dan, Chris and Matthew (all musicians) and a daughter; grandsons and a great granddaughter.